At FCJ we work with women who have experienced violence, forced displacement and other traumas. At FCJ Refugee Centre every day is Women’s Day because every day we are proud to support and advocate to access to services, justice. We open our doors to welcome them and to make them feel at home. 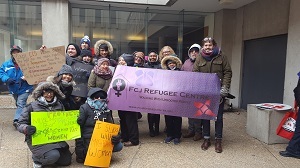 A time to celebrate solidarity between women: FCJ Refugee Centre commemorate the movement for Women’s rights.